Opel Frontera A 2.8 TDI 1995 cambelt change instructionts and replacement inteval. Full guide! Crankshaft pulley (4 bolts)  . Injection pump sprocket flange  . Turn crankshaft clockwise to TDC on 2. No.1 cylinder. Ensure timing marks aligned  . Screw suitable locking bolts into camshaft and injection pump sprockets  &  . Slacken tensioner bolt  . Move tensioner pulley away from belt. Lightly tighten bolt. Ensure locking bolts located in sprockets  &  . 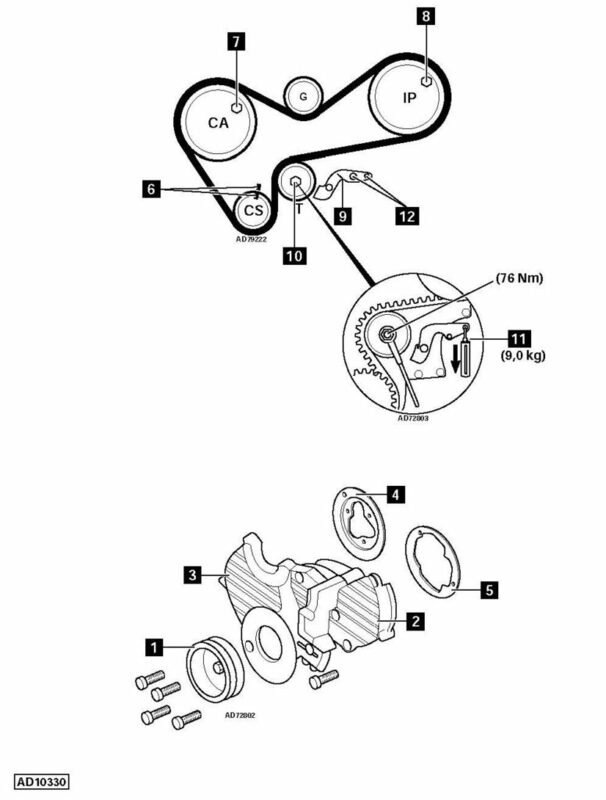 Fit timing belt in clockwise direction, starting at crankshaft sprocket. Slacken tensioner pulley bolt  . Push tensioner pulley against belt. Tighten bolt finger tight. Position tensioner lever  against tensioner pulley housing. Apply a load of 9 kg to tensioner lever  . Use spring balance. Temporarily tighten tensioner pulley bolt  . Turn crankshaft 45° anti-clockwise. Slacken tensioner pulley bolt and tighten to 76 Nm  . NOTE: DO NOT turn crankshaft clockwise during tensioning procedure. Fit tensioner lever to original position  . Tighten nuts  .